The league advises that you check with individual clubs for postponement of a match before travelling especially if the weather is poor. We will update Full-Time as soon as possible on match days, however this is dependant on availability of league officers. 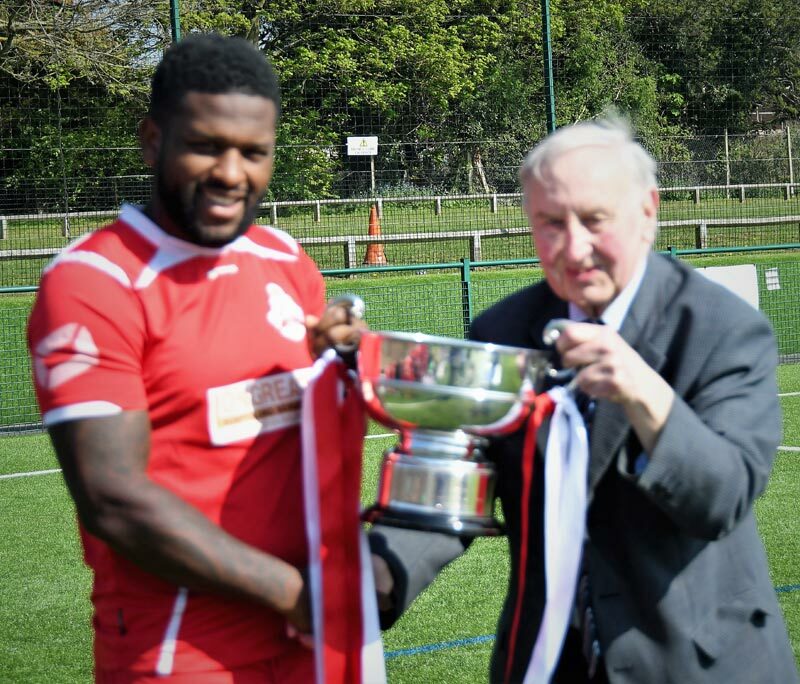 Broadwell manager Lee Williams insisted that whilst his final season in charge didn’t go as planned, there is a bright future for both the club and himself moving forward. Williams, who has been affiliated with Broadwell for 24 years, will leave the club in the summer having guided Broadwell to a tenth placed finish this season. However, after finishing sixth in 2018, Williams acknowledged that this season was something of a disappointment for his side. He said: "This season was really frustrating to be honest. We went into our first four or five games of the season with a bit of a scratch side and we ended up losing those opening games. We did rebuild the squad and we ended up being quite comfortable in the league. "Last year we were there or thereabouts but we’ve not quite been at it this season and we’ve not really been able to play the football that I’ve wanted to play." Safran Landing Systems engineer Williams alludes to a lack of ruthlessness in front of goal and a certain onus on another Williams. 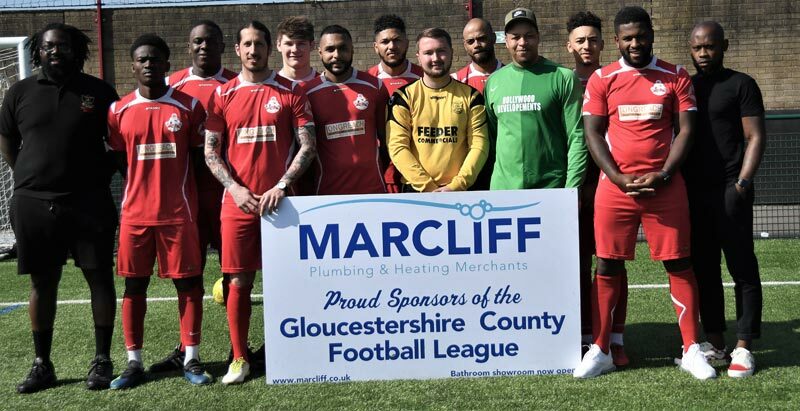 Broadwell’s Harry Williams has scored 38 goals in his last two seasons in the Gloucestershire County League, and Lee admits his side can be over reliant on their talisman. "The problem is when he [Harry] doesn’t score, we don’t tend to score. We miss so many chances. "Last season we had the second best defensive record in the league, but we didn’t create much. This season, I decided to be a little bit more open in order to create chances but we’ve just leaked goals. "It’s getting that balance right and we just haven’t been able to take our chances. We’re not clinical enough." 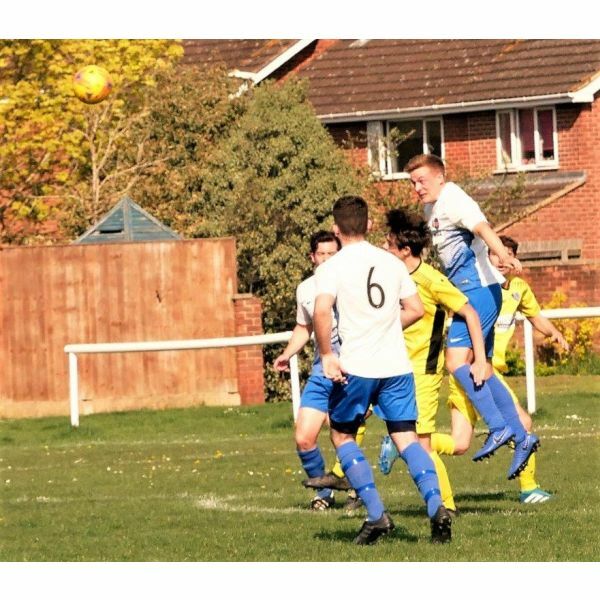 Broadwell’s final day 1-0 defeat at the hands of Patchway Town followed a familiar pattern for Williams’ side. Recounting the fixture, an exasperated Williams said: "Against Patchway we missed so many chances it was unbelievable. You can’t get away with that in the County League. Honestly, how we lost that game I’ll never know." 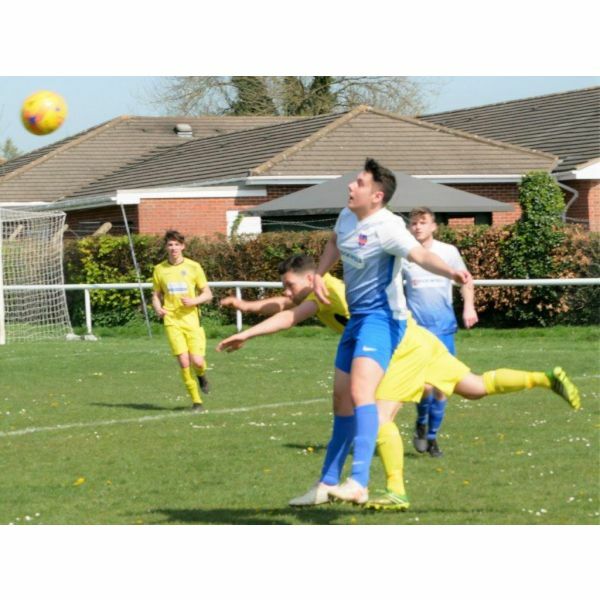 Although Williams is stepping away, the Broadwell man believes the club has a bright future and holds the potential to be a real force in the Gloucestershire County League. 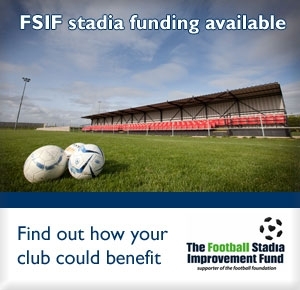 "The club and the committee are highly ambitious with the pitch and the facilities", he said. 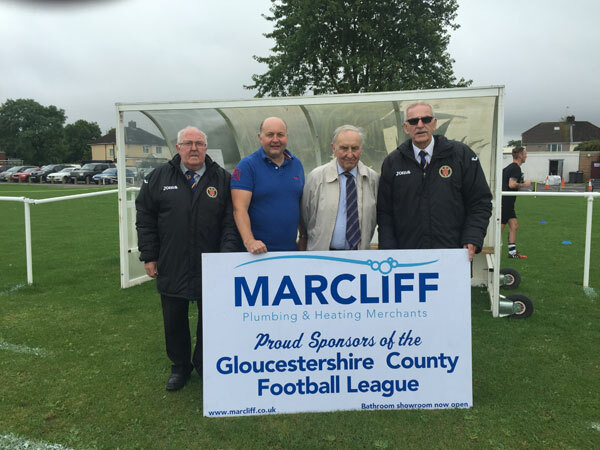 "Hopefully the club will continue to move forward with the facilities. With regards to the football, it would be nice if they could be a top four or five side in the County League consistently and that’s where I think they should be. "I really hope they do well because I’m Broadwell through and through, but secretly I hope they don’t do too well so they can give me a job in a couple of years!" Williams joked. As well as the future of Broadwell, Williams vows that his own future in football is also a bright one. The UEFA B License coach said: "My overall aim is to have a season off and then, whether it’s with Broadwell or another club, is to have a go at another challenge. "I’ve not fallen out with the club or anything like that. It’s two things really; I thought the club probably needed freshening up but also it’s the fact that it is hard work and it does wear you down – I just need to time to recharge the batteries. "I’ll stay within football. One thing I’m interested in is doing a sort of coach development scheme with the FA. I see a lot of coaches around the Forest and they could do with a bit of support. It’s an area where I can put something back into the community." However, whilst Williams promises to step a back from management he concedes the competitiveness of the dressing room will drag him back in the near future. "I think the changing room will probably pull me back into it sooner rather than later though!" Williams exclaims. "When I’m not doing anything I’ll be supporting them for sure, it’s my club and I’ll offer support where I can." 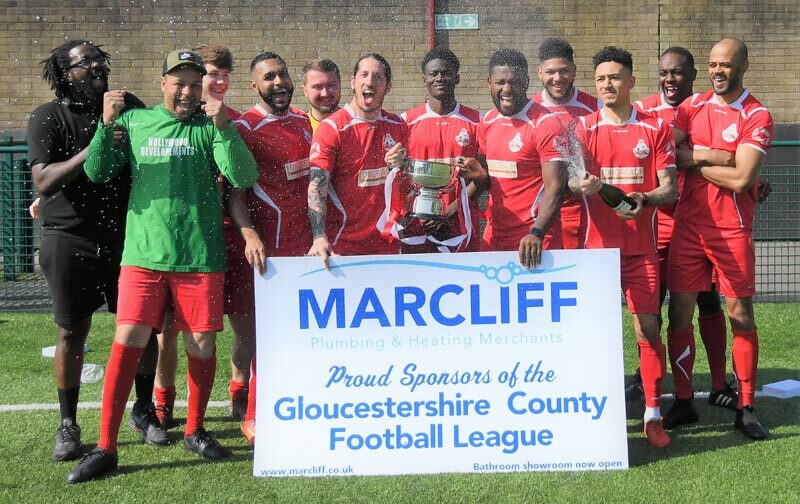 RELIEVED and delighted Lebeq United boss Rayan Wilson says it’s a case of "mission accomplished" for his club after overseeing their Marcliff Gloucestershire County League title and possible promotion successes. 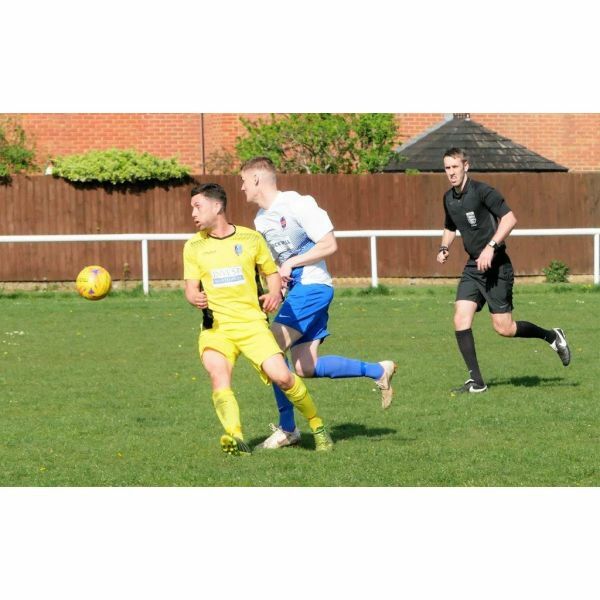 The Oaklands Park outfit dusted themselves down from their 2017-18 runner-up disappointments to edge out Frampton United and Stonehouse Town in a race to the line that became much closer than it might have been. That’s because Lebeq were docked six points for fielding ineligible players in two games towards the end of the campaign, offering their top-table rivals an unexpected opportunity which ultimately they were unable to exploit. 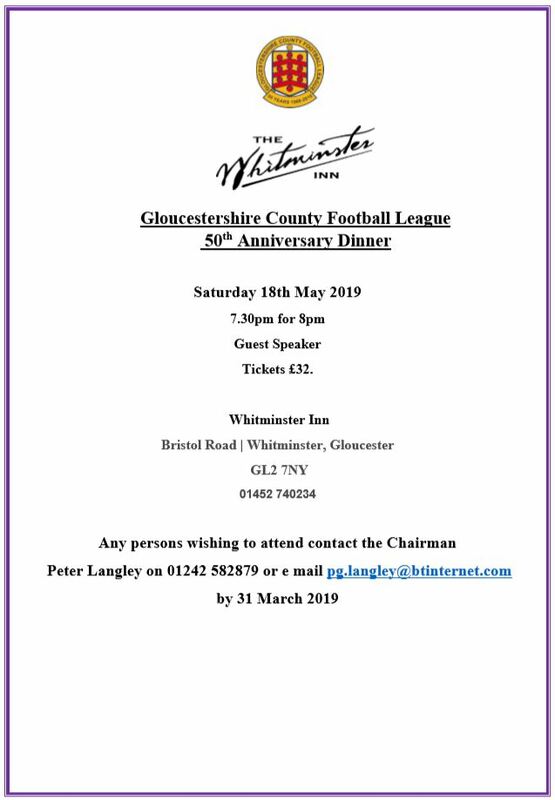 Sports rehabilitator and performance coach Wilson, who led Lebeq into the County League as Suburban League champions in 2016, enthused: "Winning the title and hopefully gaining entry into the Toolstation Western League on the back of it has been one of Lebeq’s long-standing goals. "Generation after generation in bygone years openly spoke about the fact Lebeq should already have a team at such a level, something that has never transpired. "Now the whole club has the opportunity to tick off this goal and make headway for local inner city footballers to have a platform to play at a good and higher standard, so bridging the gap even more when it comes to fulfilling young individuals’ footballing aspirations." Wilson, who is to step down as manager now their 28-game programme has successfully ended, added: "I have to thank the current team, the Lebeq committee and local community, as well as the management staff which includes Benjamin McLeod, Twaine Plummer, Aaron Wilson and Aaron Cornwall. "It has been an incredible journey, not just for myself but for all involved at the club." Of that six-point deduction, Wilson acknowledged: "It came down to admin errors on our part and if you make those types of errors then you have to stand by the consequences that come with them and learn from it. "The club have had a couple of new people in particular positions which resulted in a few teething issues." Club chairman Dwayne Smith beamed: "As a club we are very happy and proud of the team’s success this season. "The manager and his coaches have made history and taken us to new heights. Hopefully we can now continue to push forward by putting the right things in place to keep us at this great new level of football. "We would also like to thank Rayan for all his hard work in achieving two promotions in four seasons as manager and for his commitment in some testing times. "He will be moving on to pastures new at the end of this season and we wish him all the best." Lebeq founder member in the early 1980s George Philipou smiled: "I felt excited and relieved too after that points’ deduction. I’m certain it was an accident caused by administrative inexperience and thankfully it didn’t cost us. 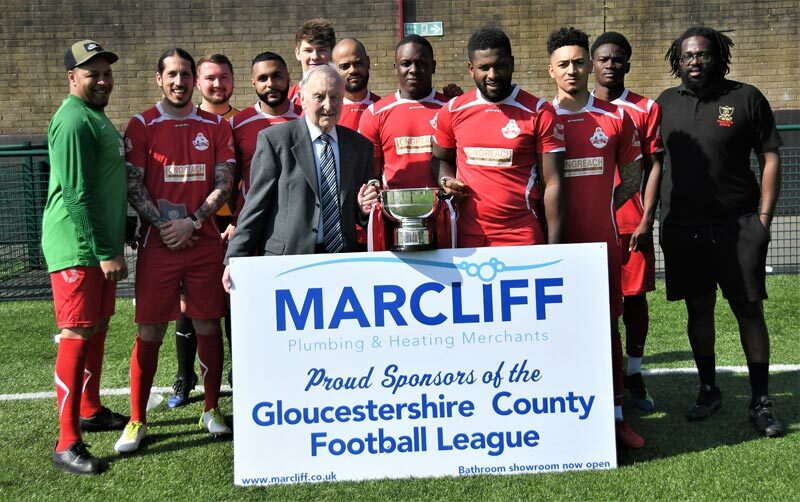 "Finishing as runners-up (to Thornbury Town) last season when we’d been in the ascendancy at times was a big disappointment, so this has really made up for it. "It’s definitely been won on merit. It’s been a great effort and they’ve been consistent throughout and played their best football to date. "I’m really looking forward now, along with everyone else at the club, to seeing Lebeq playing at a higher level. "That said a lot of our players have already performed in the Toolstation League and even higher, so while it’s a step up for the club, for many of the players it won’t be an entirely new experience. "But they’ll be looking forward to playing at those heights together with their mother club, I’m sure." Whilst many teams, including confirmed runners-up Frampton United, have completed their fixtures, the programme continues for some tomorrow with Little Stoke entertaining relegation-threatened Gala Wilton, Hanham Athletic, satisfied in the knowledge they are safe from the drop, hosting Ruardean Hill Rangers, and AEK Boco at home to Henbury (all 3pm). The following clubs have applied for promotion to step 6. Applications have been received from the following clubs. 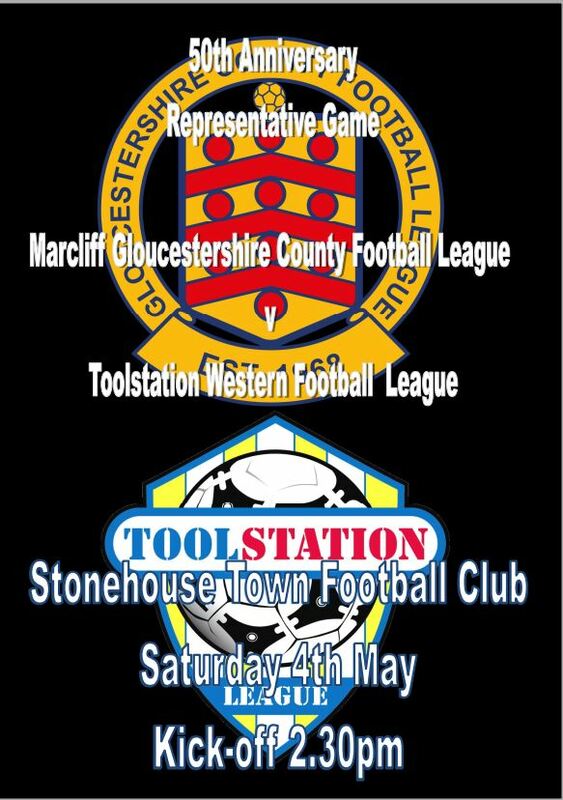 Two clubs will be promoted subject to passing a ground grading and finishing in the top three of their league. It may be necesary to accept teams from the Hellenic League, Western League or other step 6/7 leagues if the FA place teams in this league. 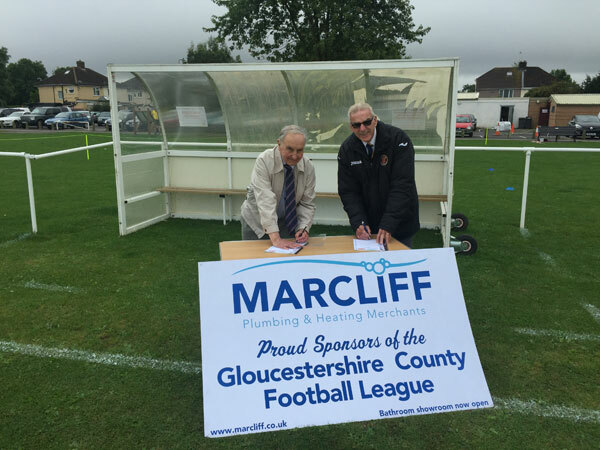 The signing of a new 2 Year sponsorship deal between Marcliff and the league took place at Little Stoke before the game. Just three fixtures in today’s programme with one left to play on Easter Monday to complete the league programme for this season. 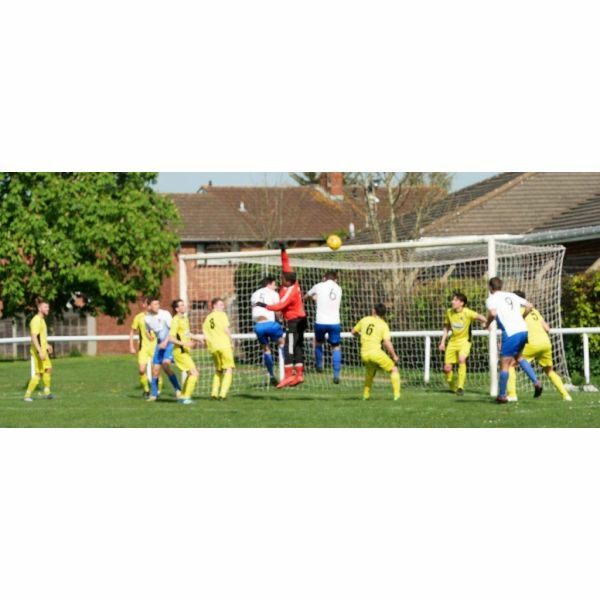 Hardwicke’s last game of the season saw the visit of Wick to Green Lane playing fields. Sam Thomas had the first attempt on goal for Wick after 8 minutes blocked and cleared away. Then on 18 minutes they took the lead with a rather fortuitous goal. Dan Sheldon drove a long free kick from the right into the box, there was a lot of movement by the players the ball bounced and unsighted keeper Jacob Hobbs until the very last moment, he lunged at the ball got his hands to it but it travelled on into the net for an own goal. Just a minute later Wick should have scored a second as Sam Thomas sent in a really dangerous cross to the far post where Grant Hewitt failed to connect and only 4 yards out from goal. Hardwicke’s first attempt on goal came from centre-back Rob Hine who fired his shot wide from 20 yards. Kieran Brice-Ingles had a good chance for the home side but he headed just over following a great cross into the box. Just before the break Ryan Barrett struck a superb 35-yard drive at the Wick goal but it just cleared the bar. In the 52nd minute a great ball from Max Barker to Joe Thomas saw the striker twist and turn the home defence before hitting his shot goal-wards but Hobbs saved well. Hardwicke manager Richard Mansell’s half-time talk must have been something special as the home side looked a lot more interested in the second half and equalised on 54 minutes from a great cross into the box from Ryan Barrett that found Will Matthews who out jumped the Wick keeper Mark White to head into an empty net. A free kick from the left by Joe Thomas in the 57th minute was pushed away by Hobbs as look as though it might have dropped into the net. The home side forced several corners in succession but they were well defended by Wick. 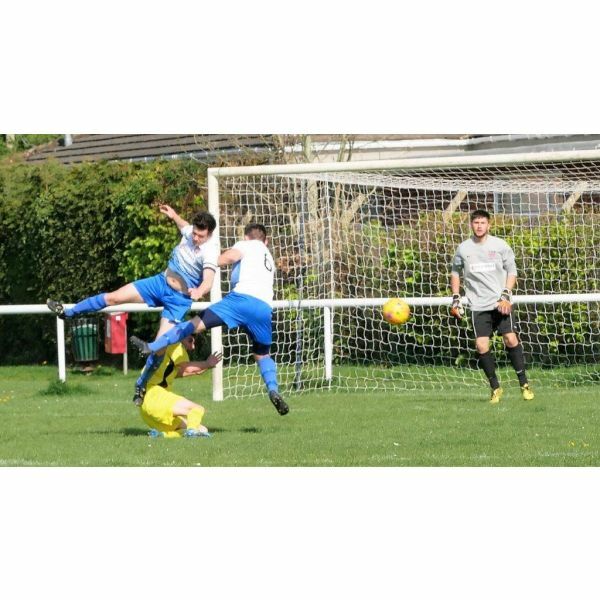 The winning goal came in the 80th minute from a long ball down the left for Hardwicke it was pushed in side to the unmarked Will Higgins who then hit a superb 35-yard pile driver past Wick keeper White. Sam Thomas had one more mazy run for the visitors but his shot was well saved by Hobbs. Right at the end Wick manager Mike Strawford brought himself on for the last minute that lasted more than five and it told. 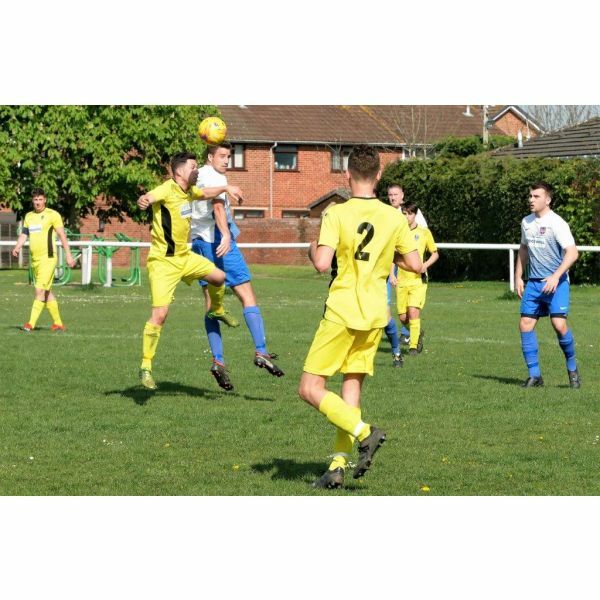 Henbury gained a very good 2-0 win over Stonehouse Town at Arnell Drive and will finish their season on Monday when they visit Wick for the very last league game of the season. 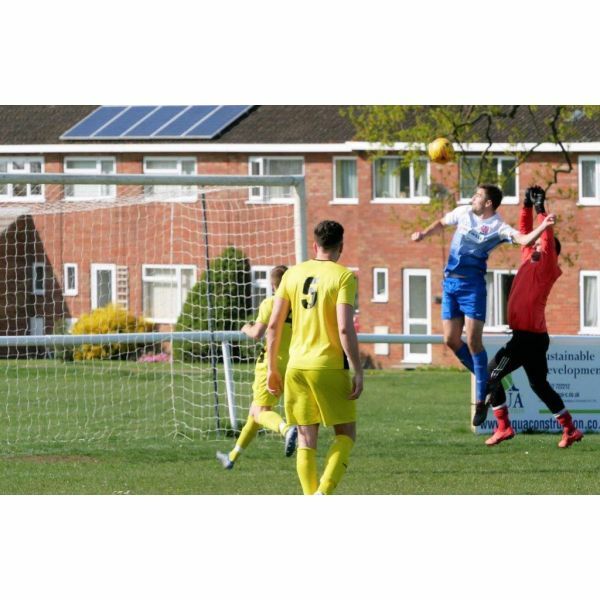 The first 20 minutes was very even in very hot conditions but in the 29th minute Henbury were almost gifted a goal by Stonehouse’s Lee Keveren when he sliced a ball from Dav Martin onto his own crossbar. Stonehouse had a great chance to take the lead on 32 minutes when Joe Williams broke clear but then came up against keeper Cameron Tarr and pulled his shot wide. At the other end a Jack Mills past into Harvey Moran was also wasted as he pulled his shot wide as well. Henbury’s Aaron Elliott got clear of the Stonehouse defence tried to lob keeper Will Pedrick but did not quite get it right and Pedrick gathered the ball. Henbury took the lead on 44 minutes when Harvey Moran broke from the halfway line and fired the ball past keeper Pedrick from 12 yards. The visitors should have levelled right on half time but Dawid Regula headed over from 5 yards. The home side made it 2-0 on 70 minutes following two successive corners and from the second Pedrick tried to punch clear but George Loud was on hand to score from close range. One last chance for the visitors to open their account came in the 85th minute when Tim Williams broke clear got to the edge of the box but failed to get the ball past keeper Tarr. 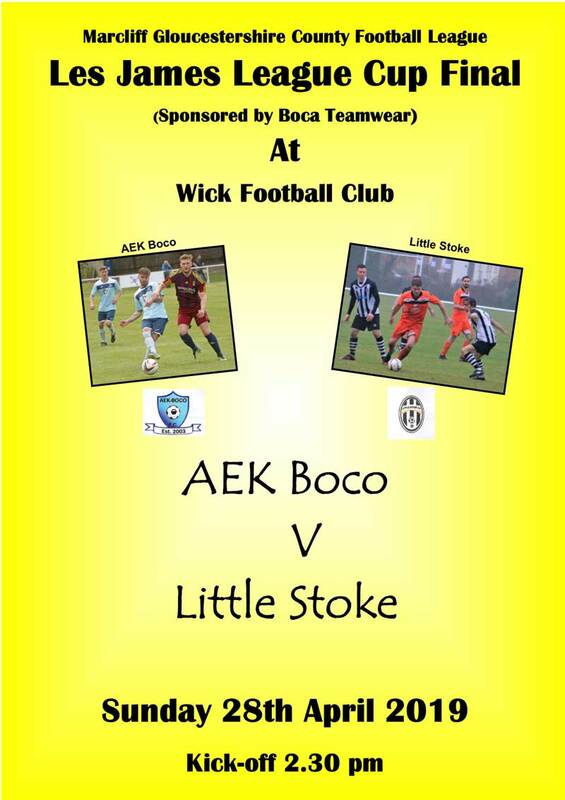 AEK Boco v Little Stoke what a coincidence this fixture should fall just a week before they play each other in the Les James League Cup Final at Wick next Sunday. Little Stoke opened the better side and were presented with a free kick after 5 minutes that was pumped into the box where it was met by Tim O’Loughlin but he directed his header over the bar. Boco’s first effort on goal came from a long punt up field by keeper Liam Jacques that was picked up by Cash Vinall on the halfway headed for goal but struggled to control the bouncing ball and saw his shot drift wide of the target. On 36 minutes Frank Taylor-Fox got into a great scoring position but then saw his shot well saved by keeper Jones. A couple of minutes later Cash Vinall found himself in the same position but he two shot straight at Jones. Boco were having the better of the play at this stage and on 43 minutes Frank Taylor-Fox whipped a cross into the box from the left but Harrison Kyte’s header drifted wide. Boco took the lead on 55 minutes, a long throw from Joe Reeve that was flicked on by Vinall and the incoming Freddie Taylor-Fox came rushing in to volley the ball past Jones from close range. On 58 minutes Stoke’s Khalil Lamir collected the ball on the halfway line beat full-back Jack Mills then sent in a tantalising ball into the box with keeper Jacques and his own defender clashed but just managing to get the ball away for a corner. Boco almost made it 2-0 on 65 minutes as Vinall’s cross found Jacob Saunders but his shot crashed against the post. On 83 minutes Harrison Kyte beat three Stoke defenders sent the ball across goal but it just eluded Frank Taylor-Fox and went out for a goal-kick. Stoke’s final effort came right at the end a great shot from Lamir that flashed past the wrong side of the upright. Some cookies on this site are essential, and the site won\'t work as expected without them. These cookies are set when the page requests details from the FAs Full-Time system to produce the tables, fixtures and results. Table, Results and Fixtures will load here if Cookies are accepted - Click on the Orange Triangle if the Control is not displayed.